Frontiersmen actually used animal tendon for strapping leather pieces together. Today we have artificial sinew which is a durable subsitute. Also known as sodium carbonate, washing soda, or sal soda. One pound of soda ash is required to activate and "set" Procion dye for approximately 15 T-shirts. Ingredients: appropriate cloth or clothing; water; urea (optional); Procion MX dyes or other fiber reactive dyes; sodium carbonate (soda ash or "pH Up"). Rubber bands, synthetic sinew, or dental floss for tying (optional). Plastic bottles with which to hold the dye (4 to 8 ounces [125 to 250 ml] is a good size). Choose the right fabric, first. Fabrics that are at least 80% cellulose fiber--cotton, rayon, linen, tencel, or hemp-- are best for dyeing. 100% is better. 50% cotton/50% polyester makes nice pastels. Cotton clothing is often sewn with non-cotton thread, which stays white, but this is not usually a problem. Avoid 100% polyester or nylon. Silk is the only protein (animal) fiber that can be dyed with this recipe. Next, wash your fabric. This can be done days in advance. Unwashed fabric may not dye well. 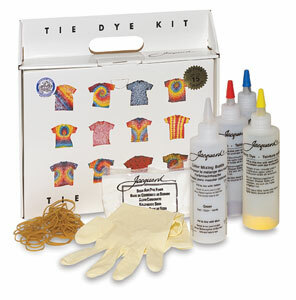 Next, if you're planning to tie-dye, tie the dry garments in advance. It's easiest that way. (Tying wet garments that contain soda ash is a total pain, because you should always wear gloves when handling soda ash, but gloves get caught in the string or rubber bands; it's okay to moisten the fabric with plain water to tie, and then soak in soda ash.) See the next page for more information on tieing. Next, dissolve dye in urea solution. The best dye to use on cotton is a good fiber reactive dye such as Procion MX, Sabracron F, or Drimarene K (buy from one of the companies listed at Sources for Supplies). (Do not use all-purpose dye such as Rit® brand dye in this type of dyeing!) Use about 4 teaspoons of dye per cup...unless the dye is or contains turquoise MX-G, in which case you should double the amount for similar brightness, or black, in which case you must use 2 to 4 times as much. If you are mixing primaries to make other shades, note that the powder dissolves much more easily after it's been mixed in dry form. Put the dye solutions into squirt or spray bottles for applying the dye - buy plastic bottles specifically for this purpose. Be careful when you measure out the dye...leave the jars open as short a time as possible, and use a face mask. Don't breathe dye! The stuff isn't very toxic, but you can become sensitized to it, which would put an end forever to your dyeing. Reaction time. Make sure that the fabric stays wet, for the reaction to take place, no less than two hours, but preferably eight to twenty-four hours. The amount of time required depends on the temperature, which should be at least 70°F (21°C). In our humid climate here, we just leave the clothing outside, trusting the urea, a humectant, to keep our fabric sufficently damp, but in drier climates you may need to use plastic wrap or plastic bags. Wash the clothing. Many dyers prefer to use Synthrapol detergent in the wash water, to help prevent dyes from mixing in undesired ways. You still need to isolate very light colors (especially yellow/orange); the problem with transfer of unreacted dye from dark to light regions is reduced by waiting a full day or more before washing out, as dye which has not reacted with the fabric will tend to react with the water, if given enough time. I like to dump the dyed items directly into the washer without rinsing first, but many prefer to rinse by hand before machine-washing. I wash first in cold, once, then twice in the hottest water available, using Synthrapol in each wash, and end by double-rinsing. You may need to wash the clothes separately the first few wearings, but pretty soon they are 100% colorfast and safe to wash with anything, in my experience. 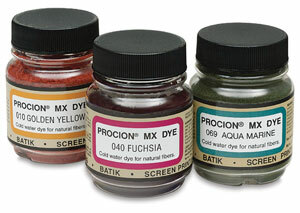 Heat setting is NOT necessary with Procion MX dyes. The only reason to use a hot water wash is to rid the cloth of the last bits of unreacted dye. It is important to use cold water before using hot water, as hot water may, in the presence of the sodium carbonate, encourage some excess dye to become a little too closely associated with the fabric, resulting in dye that gradually rinses out over the course of many washings.